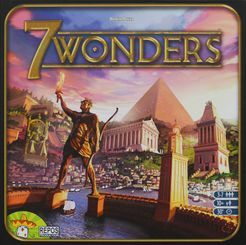 Visited Val and Chris on Sunday and took them a prezzie: 7 Wonders. Surprisingly they did not have their own copy of the game and I recently found a cheap copy on sale in a local charity shop. Only £3-50 (! ), counters unpunched and cards still in the wrappers. We sat down and played a quick couple of games. I had forgotten how good a game 7 Wonders is; it flows well, some room for aggressive play, interesting combos, and multiple routes to victory. I think focussing on adjacent players is a key to the game. Also after watching a Rahdo video it is clear the 2 player mode works well – Elaine and I will have to give this a try. I have considered buying the ‘Duel’ 2 player version, but have not played it (or really researched the game). 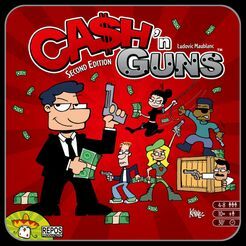 After lunch we tried Cash ‘n’ Guns for the first time (Val and Chris have played before). This is not my sort of game; too simple, too aggressive. I can see this working with a sizable group (6+) of non-gamers who are looking for a light-hearted party game, preferably after a few drinks. 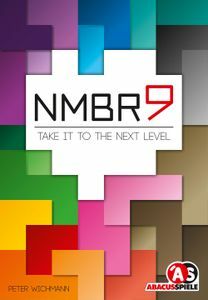 Next we tried NMBR9, which Chris had got for his birthday. A deceptively puzzling spacial awareness game that is unique in my experience. Elaine was most impressed. I did not expect to particularly enjoy the game but after 2 plays, I would be happy to give it more outings. 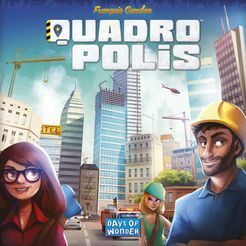 We finished the afternoon with a game of Quadropolis, a clear favourite of ours at the moment. I lost badly; I just could not seem to get my town planning mojo going.